This 5-reel, 40-payline slot game from Novomatic is hiding a secret – and that’s a massive progressive jackpot! Alchemy has been practised all over the world for thousands of years. Alchemists throughout history have tried to turn base metals into precious metals, like silver and gold. They wanted to make themselves richer and now you can do the same with Alchemist’s Secret! You don’t have to spend a lifetime in a laboratory, trying to perform miracles that are never going to happen. Instead, you can spin the reels of this slot game and strike it rich! Alchemist’s Secret has a high RTP and a jackpot that can reach tens of thousands! This slot game has features such as autoplay and gamble. You can also win Free Spins in Alchemist’s Secret! The background of the slot is pretty boring but the symbols more than make up for it. There are snowy owls, calligraphy card values, parchment and feather quills, the Alchemist and his assistant! This is a very typical Novomatic jackpot slot and it will be appreciated by lovers of their games. Particularly by those who play: Secret Elixir, Wizard of Odds and Reel Attraction. These Novomatic reels are filled with all sorts of symbols. Some pay out more than others! There are symbols which are relatively low-paying and there are symbols which pay out a lot! The symbols at the bottom of the paytable are the colourful symbols which represent card values. There’s the purple 10, the blue Jack, the green Queen, the red King and the yellow Ace. The alchemical equipment symbol, i.e. the flasks and the pestle and mortar, pay out more than the card values. So does the parchment and the parchment and quill. The snowy, white owl pays out slightly more than these two symbols. The next highest-paying symbol is the pretty Alchemist’s assistant and the Alchemist pays out the most. He’s an old man with a grey beard, and he looks a lot like Santa. He and his assistant need two or more well-placed matches to pay out. The other symbols need three or more matches in the right places to pay out. The paylines (40 in total) can be active or inactive, and you can choose how many of these you want to bet on. Then the amount you bet per active line can also be changed. So, any player with any budget can enjoy Alchemist’s Secret. Payouts are awarded when you spin enough matching symbols in the right positions. The paylines pay one way, and this is from left to right. This means that the matching symbols need to fall from the left-hand side, i.e. the first of the matching symbols needs to land on the leftmost reel. The rest of the symbols need to follow on consecutive reels, on one of the active paylines. Each payline follows a different pattern and you can see each of these on the paytable. After a win, you can gamble it if you’re feeling lucky! The gamble feature, depending on how lucky you are, can either multiply your win or lose it – so give it a go if you’re a risktaker who wants a chance at multiplying their wins! Not only is the Alchemist the highest-paying symbol on the reels, he is also the symbol that can trigger the Free Spins and win you the progressive jackpot! Even better, he can substitute for any other symbol. He pays in Scatter from two matches and he triggers Free Spins from three matches! In Alchemist’s Secret, you can win 10 Free Spins at a time and they come with a great bonus feature. Every time an Alchemist symbol falls on the reels, it will stay in place for the rest of the Free Spins. Like in the normal game, the Alchemist acts as substitute for every other symbol. That means that with every Alchemist symbol you spin, you’ll be increasing the chances of you getting a win on that spin and every spin thereafter. What’s more, you’ll get one step closer to the jackpot! 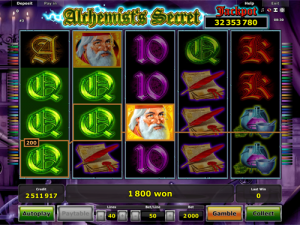 To win the jackpot in Alchemist’s Secret, you’ll have to fill the screen with Alchemist symbols!